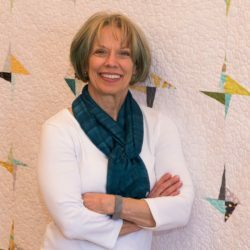 If you’re stumped on how to quilt your work, join me for a mini-seminar on how to create a personal quilting plan for your quilts. Together we will look at student quilts and discuss a quilting plan that the maker will be able to stitch and also be excited about. I will lead a discussion of design principles that will enhance the quilt and carry forward the vision of the maker. Quilt for discussion, pencil and paper for taking notes, camera or cell phone for photos. NOTE: Students would have to submit images of their quilt ahead of time. Booking for How Do I Quilt This?